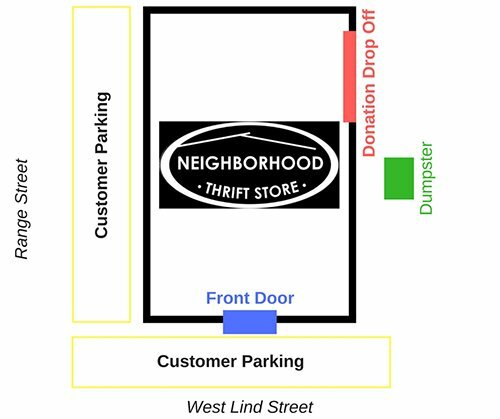 All items for donation should be taken to the brown side door on the west side of the Neighborhood Thrift Store (see donation map). While we are able to unload any containers or bags you wish to keep, we find that it is easier to bring your donations in a container you are also able to donate. A staff member will be available to help answer any further questions and provide you with a tax receipt for your donation upon request. Unsure of what you can drop off? Check the list below to see what items the Neighborhood Thrift Store can use. Have something unique to donate? Feel free to give us a call during business hours at 507-625-7228 to see if we can accept it. We will not accept any item that has been exposed to mold, mildew or cigarette smoke. The Neighborhood Thrift Store welcomes and appreciates all monetary gifts as well as gently used and new merchandise. Maintaining our mission of serving our community takes so much time, talent and treasure. Cash donations help us continue serving those in need in the Greater Mankato Area and all donations are tax deductible. Thank you for supporting us while we serve our community.